Key Difference: Hybrid Cars are cars that run on a hybrid engine, which are types of engine that rely on two or more different types of power sources. In most cases, these two power sources are petrol/gasoline and electricity. Similarly, electric cars are cars that run on an electric engine. These cars run on only one type of power source, i.e. electricity. Their power comes from a larger rechargeable battery. Cars are one of the primary forms of transport for most people. Even people who take public transport, often dream of owning their own car. However, there are many different types of cars out there. Most are typical cars that run on petrol or gasoline, whereas some are hybrid cars or electric cars. Hybrid Cars are cars that run on a hybrid engine, which are types of engine that rely on two or more different types of power sources. In most cases, these two power sources are petrol/gasoline and electricity. Most hybrid vehicles that are present in the market run on these two different types of powers, where the driver has a choice switching between the two. For example, if one is running low on electric power, they can switch to petrol/gasoline, or vice versa. In some hybrid cars, the two engines run simultaneously, automatically switching between the two power sources depending on the type of power needed or use both of them together for an added boost. For example, for low cruising speed or for traffic the car might run on electric power, however when high speeds are required it might switch to the petrol/gasoline as the electric engine might not be able to effectively provide that much speed. The car is designed in such a way as know and calibrate the best power source required and effectively switch between the types of power sources available. This decision and calibration is done by the on-board computer. Similarly, electric cars are cars that run on an electric engine. These cars run on only one type of power source, i.e. electricity. Their power comes from a larger rechargeable battery. This battery needs to be charged for power, and the car will run as long as there is charge in the battery. This is similar to any other electronic device, such as a smartphone. One needs to charge their smartphone and can use it as long as the phone has battery left. The benefit of hybrid and electric cars is that they are much more environmentally friendly than a traditional petrol/gasoline car or a diesel car. The traditional cars tend to rely completely on oil and fossil oils, whereas hybrid and electric cars rely primarily on electricity, which is much more environmentally friendly. Also, depending on the cost of electricity in the area, many times using hybrid cars and electric cars tends to come out cheaper. The primary difference between hybrid cars and electric cars is that hybrid cars have two distinct engines that run-in collaboration, effectively switching between each other for optimized performance. Electric Cars, on the other hand, have only one type of power source, i.e. electricity and do not get the option of switching power sources. In comparison, electric cars tend to be more environmentally friendly as they do not use petrol/gasoline at all, whereas an hybrid car does tend to use it at certain times. The usage is still much less than a traditional car. A benefit of hybrid cars over electric cars is that when the car is running low on electric power, the hybrid can just switch to petrol/gasoline; electric cars don’t have that option. However, electric cars tend to typically have a larger battery than hybrid, hence their engines tend to run longer. Of course, the actual usage of duration also depends on a lot of other factors, such as the type of car, the size of the battery, driving location and conditions, etc. A downside of both hybrid cars and electric cars over traditional cars is the fact that they need charging. Most countries do not have an infrastructure to support electric cars, i.e. they are no charging points available on the road where people can charge their car. This limits how far an electric car can be driven. 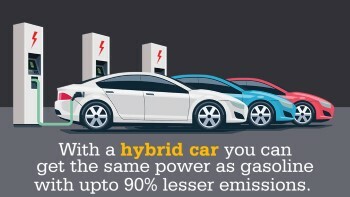 In these cases, hybrid cars tend to be more helpful as the user can always switch to petrol/gasoline when they run out of charge. Car manufactures are combatting this by creating cars that can be charges at regular household charging points and do not require special charging points. Still, charging does tend to take longer, a few hours at least and overnight at most. But hybrid cars and electric cars are constantly improving. A benefit of electric and to some extent hybrid cars is that electricity comes out to be cheaper than petrol/gasoline in most locations. Hence, the cost of driving per mile becomes lesser. Since, hybrid cars tend to use both electricity and fossil fuels, the cost per mile varies depending on the type of fuel the car ends up using more. In short it can be said, that a hybrid car is the step between traditional cars and electric cars. It has the benefits and drawbacks of both. Hybrid Cars are cars that run on a hybrid engine, which are types of engine that rely on two or more different types of power sources. Electric cars are cars that run on an electric engine, i.e. electricity. Usually less than traditional cars and hybrid cars.